But not just any pick-up. Notice the floral decorations and what a shiny new model it is. 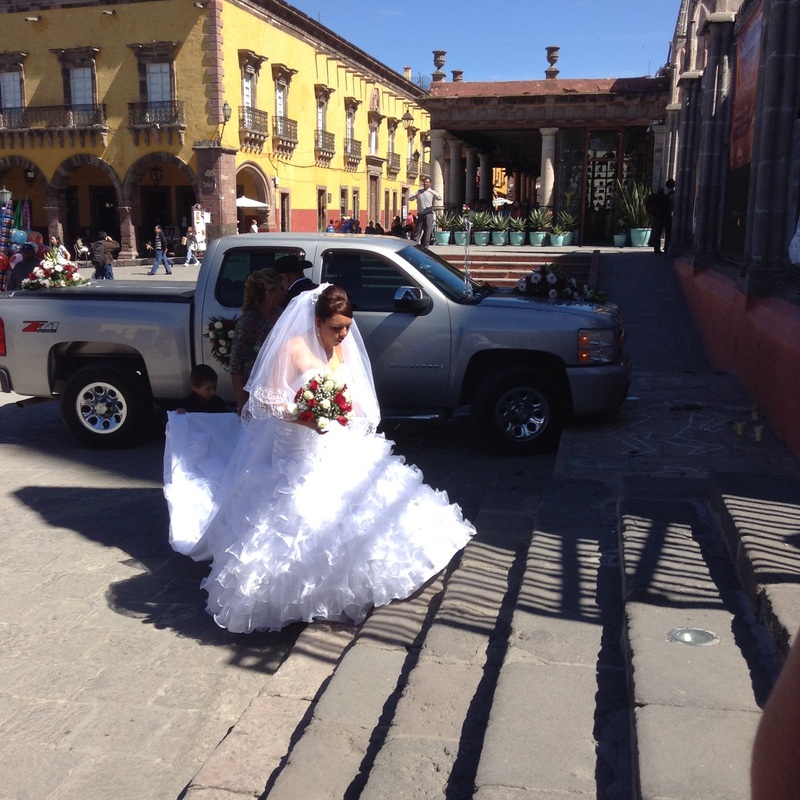 Yesterday, Saturday, was the day for weddings in San Miguel. This one took place in the big ” parochia” of San Miguel the archangel. Some people mistakenly call it the cathedral but since San Miguel is not officially a city, it’s just another parish church. However, it is the fanciest, the most famous and iconic so, I guess it’s a big deal to get married there. This bride’s dress had a long train held up by a very serious-looking young man. Her dad was wearing an impressive cowboy hat and her mum was in a long formal sparkly gown. Weddings here are the moment to shine. In my own neighborhood of San Antonio there were two evening weddings and I caught a glimpse of the reception in the parish hall across the street. A mariachi band was in full force. Mariachi singers, I notice, are fearless. Sometimes the notes are afraid of them and slide away but there is always a hot horn or a few sweet violins to haul up the melody. I learned last night that fire crackers are a part of wedding festivities. I learned it all evening and at two am and again at six am. The morning volley was long! I did manage to get back to sleep but then the gas truck came by at 8 am. The gas canisters jolt along in back of a truck that blasts music with a voice-over exhorting people to rush out and exchange their empty canisters for full (shades of Alladin) A night like last night certainly encourages the notion of siesta and think I might indulge this afternoon. Will be attending a symphony concert this evening. I specifically bought a ticket to hear the Rimsky Korsakoff Easter piece but on the latest poster they are advertising among other things a Mendelshon Hebredies concerto! They appear to have dropped my favorite. That’s Mexico, I guess. I am interested to see what the inside of the concert hall looks like. San Miguel sunsets are justly famous. No photo ever does justice but here is a pale image. Just add firecrackers and serve. This was taken from the roof terrace.